Michigan winters come with harsh conditions. Our team has been busy fixing roof leaks and home ice dams as well as installing new roofs. 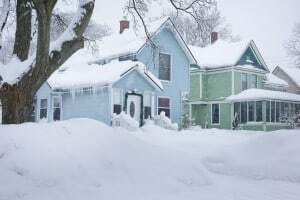 Working in the insurance restoration and home improvement business, we work quickly to resolve weather-related issues for Michigan homeowners. And, for some homeowners that means installing a new roof. Yes. When done properly and by experienced roofing contractors, roofing in the winter can be done successfully. We don’t consider cold temperatures to be ideal for roof installation, but sometimes it is necessary. Some contractors will not do winter roof replacements. Winter roofing can be dangerous. Slippery or damaged surfaces come with inherent risks. Ice dams cause additional complications. Projects in the winter can take longer, and some teams don’t have the manpower to dedicate to these installations. Unfortunately, accidents do happen when working in dangerous conditions. Unless you’re experienced with working on slippery roofs, it’s best to hire a professional for all winter repairs and replacements. It’s important to ensure that you hire an experienced roofing contractor. Don’t always go with the lowest bidder and understand what your insurance will cover. It can be helpful to ask your roofing contractor about the team’s experience in cold months. Many contractors even carry smartphones with pictures of recent projects; ask to see examples of the team’s work. For many roofing professionals, winter roofing is just part of the job. Our team has years of winter roofing experience; this ensures they know the proper procedures, and will walk the homeowner through each step of the process. Shingles installation is best above 40 degrees Fahrenheit. To properly install shingles and protect your home against future ice dams, it’s best to complete roof installation in temperatures above 40 degrees. Cracking and damage is more probable when temperatures fall. And, as Michiganders know­—temperatures can vary quickly. That being said, we can do alternative installation methods to resolve immediate issues. Roofing experts must handle shingles carefully and do their work efficiently, doing so decreases the risk of problems. 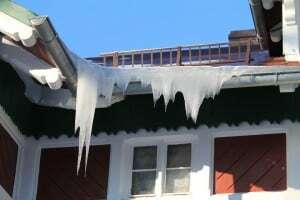 Ignoring best practices will cause the roof to fail prematurely or allow future problems, like ice dams. Metal roof installation is fine during the winter. The metal roof installation process varies from other materials, like shingles. For shingles projects, the adhesives become the biggest concern in lower temperatures. Metal doesn’t use these adhesives, so winter has no impact on our process. Water cannot travel upward due to the design of metal roofing. And, snow typically slides off the metal materials, lessening the risk. Winter roofing projects can take longer. The sealing process for all roofs doesn’t happen in below-freezing temperatures. If it’s not an emergency, roofers will usually wait until there are few days of favorable temperatures to perform the job. If in doubt, check the manufacturer’s label. Some products require specific weather, but generally speaking, 40 degrees Fahrenheit and above can work okay for roofing. As home contractors, we prefer temps around 70 degrees for effective sealing. But, we can work around those challenges, when necessary. Home contractors should have the experience to recommend when winter roofing is unsafe or less than ideal. If you’re concerned, inquire about the specific materials being used on your project. Most roofing supply companies have websites where information can be verified. Ask the contractor for brand and style information, then do some quick research. Michigan homeowners should do a roof inspection in late summer or fall. Proactive roof maintenance is always best. It saves Michigan homeowners time, hassle and money. We always recommend clients regularly check their roofing to ensure its condition can support the harsh winter conditions. Removing leaves and debris from gutters is important to ensure a problem-free winter. Chimneys should also be inspected. Spring through fall are ideal for roofing replacements. Fall is often busier for home contractors due to winter preparation. If you’re budgeting for a roof replacement this year, consider a spring timeline. Because crews are typically less busy, wait times in spring months are often less. Roofs can be warmer than the air temperature. Home heating and attic airflow can increase the temperature of roofs. The sun can also have an impact on the roof’s temperature. If a stretch of sunny days is predicted, this may create more favorable installation conditions even if it’s very cold outside. Proper storage of roofing materials can also decrease risks associated with winter installations. Don’t wait to repair winter roof problems. Some homeowners fear that winter conditions will result in a terrible roofing project. Then, they delay the repairs and let the roofing problem get worse. Leaky roofs and ice dams can cause serious issues to homes if not resolved quickly. A roof is your home’s protective shield. Take care of it the best you can. Do you need roofing in the winter? Our team can help! Give us a call or click the button below to fill out our short contact form.